How do you take a team from "rock bottom" one year, to a cup final and a top-six finish in the Women's Premier League in the next? For West Ham Ladies, the answer is bring in a Hammers legend as manager. 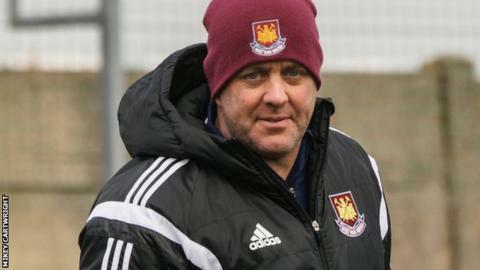 Julian Dicks, who had two spells at Upton Park as a player, was appointed as West Ham Ladies boss in June last year, a rare foray into women's football management for an ex-star of the men's top-flight. And despite losing to Charlton in the London FA Capital Women's Cup final on Wednesday, Dicks' side have made significant progress under his tenure so far. West Ham Ladies finished second-from-bottom in last season's WPL Southern Division, with 13 defeats in 20 league games. That was the club's worst season since 2006-07. But did the man the fans nicknamed "The Terminator" ever imagine he would one day be managing the ladies side? "No, I didn't. If you'd have said to me maybe five years ago that I'd be managing a women's team, I'd have said 'not a chance'. "It's because it is West Ham. If it hadn't been West Ham, I would not have bothered, to be honest. "I love the club dearly. That's why I got involved." Former England Under-21 defender Dicks, who also played for Liverpool and Birmingham City, was adored by West Ham fans for his tough-tackling and passionate style, and once even dyed his hair claret and blue. When it was suggested that he should grow his hair longer in order to earn an international call-up, he further endeared himself to the West Ham faithful by promptly shaving it off completely. This is not his first venture into football management - he had a short spell at non-league Wivenhoe Town, steering them away from relegation before leaving the club by mutual consent in June 2009 and then managed Grays Athletic for 20 months before leaving in May 2011. Julian Dicks was the last signing Graeme Souness made in his time as Liverpool manager. He was also the last Reds player to score in front of the old, standing Kop end, netting against Ipswich Town on 9 April 1994 before the stand came down at the end of that season. But does having a former men's Premier League star in charge make a difference? "He was one of the main reasons why I decided to go to West Ham, as soon as I knew he was there," said former Chelsea, Watford and Millwall striker Emma Sherwood. "He's a big name and it's a pleasure to play under him. "To have a star and an idol to look up to, and guide us in the right direction, is a big difference from what it was like last year at the club. It was sort of rock bottom." Former Leyton Orient youngster Danica Revell, who has been at West Ham for five years, echoed those sentiments. "Since Julian has been the manager, I think the team has come together more," the 21-year-old centre-back told BBC Sport. "He knows what he's talking about. "Last season we were right near rock bottom. Julian is so different. I'd definitely call him a motivator." Despite admitting to sometimes "wanting to kick the cat" in frustration during training sessions, Dicks says the women's game can be a breath of fresh air for someone so used to the men's game. "The good thing about the ladies is there aren't any egos," he added. "There are no attitudes, they don't fake injuries and they don't try to get people sent off, and that's refreshing. "I am pleased with the improvement (this season). All I wanted was progression." But what can the club, now in the third tier, achieve under Dicks in the future? "I definitely think we could push for the Super League," added Sherwood. "West Ham is a big name and Julian is the right person to guide us. All we need now is a stronger support network." Dicks added: "Obviously only one team can go up, and it's difficult because there are some very good sides, that pay their players. My girls and myself are all self-funded. "Hopefully next year there can be another progression. Hopefully we can get some money on board to start paying players and get better players in. With one league match remaining, Dicks' side have 35 points from 21 games and a goal-difference of +11. They beat Tottenham, Haringey and Queens Park Rangers en route to London FA Capital Women's Cup final. "For me the commitment lets the girls down, but this season they've responded really well. "Last season, we had girls go on holiday and take weekend breaks. "They have knuckled down and haven't had those breaks." West Ham travel to league leaders Portsmouth in their final game of the season on Sunday, with the hosts looking to secure the WPL Southern Division title.